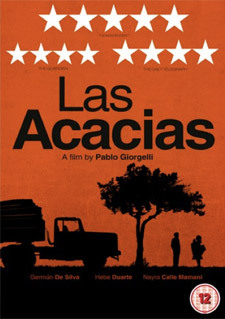 Winner of both the prestigious Sutherland Award at the 2011 London Film Festival, and of the Camera D'Or at Cannes last year, Pablo Giorgelli's critically acclaimed road movie Las Acacias was a festival favourite, and Giorgelli singled out as a talent to watch. With pitch-perfect performances from character actor German de Silva and newcomer Hebe Duarte, Las Arcacias tells the story of a long distance lorry driver (German de Silva) who agrees to drive a woman (Hebe Duarte) and her 5 month old child en route from Paraguay to Buenos Aires. A subtle and tender road movie exploring loneliness and the pain of loss, Las Acacias grows into a searingly poignant tale about a passing encounter between two strangers and the unlikely bond that grows between them. Described by Mark Kermode as "An absolutely beautiful movie...the kind of film where you think at the end, yes make them like that! ", "absolutely beguiling" by The Guardian and selected as film of the week by The Independent, the film also won the ACID Award, the Golden Camera and the Young Critics Award for Best Feature at last year's Cannes Film Festival. Las Acacias will be released on UK DVD and Blu-ray on 9th April 2012 by Verve Pictures at the RRP of £15.99 for the DVD and £19.99 for the Blu-ray.